‘Cat’-astrophe averted! We just had a long weekend and might I say, the Monday was a bit more eventful than we had planned. I have a “honey do list”, it’s not extensive but one of the big things I needed my spouse to get at was replacing a post on our front porch that was rotten. Monday morning he was getting his materials organized and I was getting a load of laundry ready to hang out. 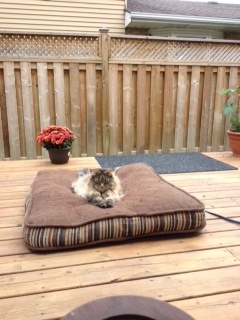 Our cat Romeo is an indoor cat, who likes to go outdoors. I was heading out the back door, laundry basket in hand, the dogs were jumping around my feet eager to go out and the cat decided he was going to join them. My hands were full, I figured I would give Romeo the opportunity to explore for a few moments. Romeo likes to sniff around the Barbeque, when he is done he usually stops near our patio set and the stairs that lead to the back yard and he patiently waits for me to hook his collar up to the leash. He likes to an adventure and I thought I would indulge him! Besides, I was watching him, one minute there he was sniffing around the cover of the BBQ and then next I had lost sight of him. He’s a big cat, so he is usually pretty easy to spot. I was starting to worry he had slipped under the gate to the side yard when I saw the tip of his tail disappear under our deck where the drain pipe comes out. Crap, I went flying into the garage to announce to my spouse that the cat was under the deck, he was chatting to my daughter and the two looked at me like I was ‘cat’egorically crazy. He, my daughter and I whisked out to the back, crawling around on all fours peering under the sides to try and see if we could see our dear cat, but it was too dark and Romeo is a mottled grey colour, so was nicely camouflaged . 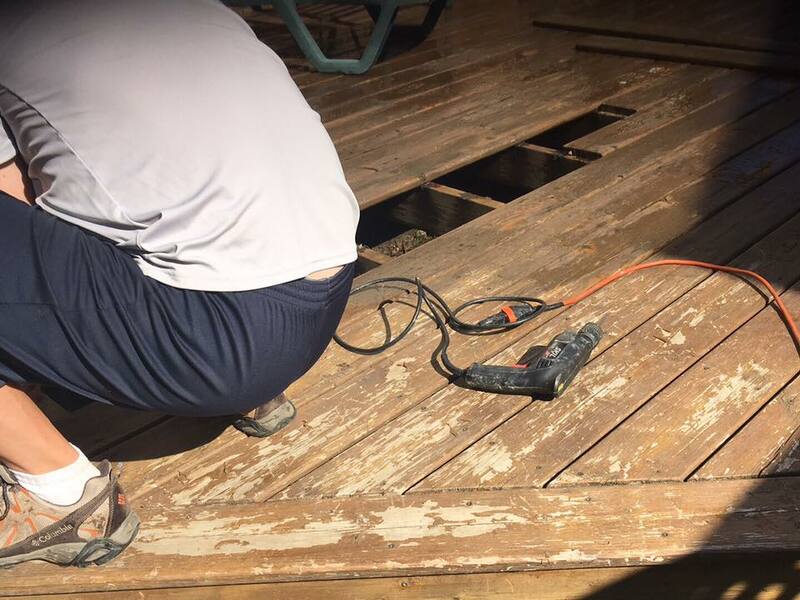 Both my family members were doubting that he was under there, but my spouse finally went into the garage and returned with his cordless screw driver and started taking apart the boards. After removing a good section he popped his head down into the hole and announced that Romeo was indeed down there, and of course at the furthest point possible sitting on a joist. Great, there is one thing about Romeo, he can sit in a spot for 6 hours if he decides he’s comfy, he’s got staying power. We had a couple options, I could have begin a vigil and sit out back and wait for him to get the notion to come out from his new found hiding spot, we could try enticing him with food or perhaps the hose might be a good motivator. When the food idea failed we opted for water, I began spraying the deck rather vigourously as my spouse hung his head down into the void so he could direct me as to where I should spray the water. “Go left, now go right, come over here, he’s in the far corner, now he’s moved to the middle section…finally he got close enough for my daughter to reach in an pull him out! Romeo was not impressed, he was muddy and covered in leaves and looking rather water logged. As irritated as I was with him for breaking the code of aimless meandering whilst waiting for me to put on his leash, I decided to let him lay out in the grass. My spouse put the deck back together and went back to the garage and I hung the clothes out to dry. I went to head down the stairs into the house only to realize I was so panicked about loosing my dear Romeo I had plum forgotten that my daughter’s cat was staying with us and I had left the back door wide open when I came out with the laundry. At this point I was feeling rather like I needed a good kick in the kiester! I enlisted my daughter to began a search for Savanah! Thankfully after a few short minutes we found her perched on a chair in the basement, a few feet from the door. I guess freedom didn’t seem that enticing, what with dogs running about barking, humans using noisy electric tools and hammers and the crazy lady running about with a hose in hand spraying water everywhere. Today, as I went to go out into the back yard to let Romeo have some R&R I momentarily forgot to close the door and then I remembered the “catasrophe” from the day before and that there is no one home to enlist to come to my aid and I closed the dang door!